I've heard Frankie Valli songs all my life, of course. The Four Seasons put out "Sherry," their first #1 single, a few weeks before I was born in 1962. Frankie Valli and/or his original band The Four Seasons had dozens of hit singles over 20+ years, many of which are staples of oldies radio familiar to younguns then unborn. You can't very well have much interest in American popular music and not know "Stay" or "Walk Like a Man." But I confess that I really hadn't paid proper attention to their considerable artistic achievements. I've become aware of this due specifically to a beautiful new Rhino box set The Music of Frankie Valli and the Four Seasons. This set consists of three CDs and a DVD of vintage television performances and a couple of simple pre-MTV music videos. I'm sure that this will quickly come to be known as the definitive all-you'll-ever-need Frankie Valli document. The act was credited as Frankie Valli and the Four Seasons, but he doesn't necessarily look like the central creative force on review. First off, the principle point of the performances are the fancy doo wop derived vocals. That would make the whole group near equally important on that count, including Bob Gaudio (formerly of The Royal Teens) on keyboards and tenor vocals, Tommy DeVito on lead guitar and baritone vocals and Nick Massi (later Charless Calello and then Joe Long) on bass guitar and bass vocals. Besides that, Valli isn't a songwriter. Most of their hits were written by Gaudio (author of "Short Shorts" as a Royal Teen) and the group's producer Bob Crewe. Being a white American vocal harmony group in the early 1960s, they would have been considered the prime direct competition to the Beach Boys. The Four Seasons were the East Coast answer to the West Coast Beach Boys. Billy Joel has talked about how the Beach Boys were fine, but that it was the Four Seasons that his teenage crew was imitating on the street corner. Partly, I see the connection there as working class Italians being easy for the likes of young Billy Joel to identify with. From there, it's easy to sense a basic level of class distinction between the two groups as a way better to understand them both. The Beach Boys were basically rich white kids growing up, not particularly ethnic nor class conscious. "Fun Fun Fun" is rich kid amusement, with the worst tragedy being loss of use of the T-Bird. Whereas the Four Seasons were more working class, and dealing with more real-world stuff. Some of their best songs drew their emotion from true love running into social class realities. "Dawn" and "Rag Doll" bring in both sides with the man looking, respectively, up and down the social ladder. The Beach Boys were brilliant, but I can see how Bruce Springsteen might have gotten more soul sustenance and identified more with trying to "Walk Like a Man" than with the "California Girls." The Four Seasons were pretty damned brilliant as well, though. Except for the Pet Sounds album, Frankie and the boys can pretty well go head to head with Brian Wilson and fam. They had about as many hits, and they were mostly all excellent songs. Besides the fancy vocal arrangements that were their prime appeal, "Working My Way Back to You" and "My Eyes Adored You" are memorable pop songs. Then there are the vocal harmonies that were the prime point for both groups. In this category, the Four Seasons make every bit as unique and memorable a vocal chemistry as the Wilson family. Then the Four Season had that secret weapon, Frankie's ultra-high but totally hard falsetto. This could get a special kind of thrill all their own. There's just nothing in Brian Wilson's catalogue that quite equals the visceral rush of "big girls, they don't CA-RI-I-I!" Broadly, the forebears of the Beach Boys were the white bread Four Freshman and the Inkspots. The Four Seasons, by contrast, were close cousins to street corner doo wop. For thirteen years, from 1962 to 1975, the Four Seasons recorded some of the best pop singles going, including 26 songs that made the US top 30. Besides the more familiar hits, I was struck real curious by their cover (as the Wonder Who) of Bob Dylan's "Don't Think Twice." On one hand, it's a really memorable and skillful arrangement and it was a top 20 hit. But it sounds to me like the point was that they're mocking Dylan's deep poetry with the falsettos and silly vocal noises and effects. I think. I just know it's got me twisted up enough to listen to this recording a dozen times trying to figure it out. It just sounds funnier every time. By contrast, I wasn't bowled over by their perfect sincere top ten arrangement of "I've Got You Under My Skin." The instruments were maybe more inspired here than the vocals, edging into something of a Phil Spector like Wall of Sound. "Saturday's Father" was a noteworthy flop in 1968, failing to make the top 100 at all. But this song (and the contemporary video on the DVD) was my biggest cool new discovery in this mess. It's an experimental piece, clearly inspired by the psychedelic sounds of the era. A perfectly good doo wop derived group chasing silly 60s trends would not in theory sound promising to me, but this came out exceptionally well. I'd put this head to head with Love. The construction and orchestration are really effective. Interestingly, the fancy vocal harmonies that really make this sound distinctly like the Beach Boys rather than their regular doo wop. The Four Seasons could do it that way, and about as good as the Wilsons. Then again, I can hear something more like that Beach Boys style as far back as "Rag Doll" in 1964. What really keeps the song grounded and makes the thing work is the lyric about a child of divorce who only gets to have a father on Saturdays. By the time they get to the concluding statement filled out with the beautifully mournful heartbreaking harmonies of "today was father's day," you're definitely getting into "Caroline No" territory. You might consider this song a refugee from Pet Sounds that accidentally got written and recorded by another group. It's pretty cool. The vintage video was particularly good as well, with the images of the father and daughter mixed with performance footage. Also, thankfully, the parts with the band singing do not involve any groovy psychedelic threads. 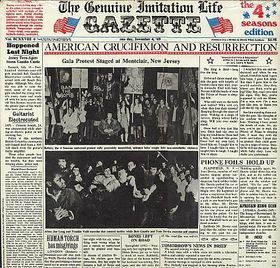 "Saturday's Father" came from a 1969 album The Genuine Imitation Life Gazette. For one thing, this album had a mock newspaper on the cover, an idea picked up over the next several years by John Lennon among others. The title song "Genuine Imitation Life" is pretty outstanding as well. They actually got 6 minutes+ worth of song there. In both of these songs, they get the general benefit of the expanded musical vocabulary of psychedelia, but approached by sharp professionals who had the pop skills to do some interesting and memorable things while avoiding a lot of the more silly or ephemeral aspects of the era. Even the chameleons and and crocodiles make sense as examples of the "imitation life" theme. I'm inclined to dock them a point on this one though for coppin' a little "Hey Jude" chorus near the end, which struck me kind of annoying. For The Genuine Imitation Life Gazette album, Gaudio collaborated on the songs with an interesting cat named Jake Holmes. Among other things, Mr Holmes was apparently the actual original author of the Led Zeppelin classic "Dazed and Confused." In his better known role as a jingle writer, he's also credited as co-author of the "Be a Pepper" jingle - along with Randy Newman, no less. Right after this, Gaudio and Holmes wrote an experimental album for Frank Sinatra called Watertown. The early records (1975 and before) that came out as official Frankie Valli solo records were written and recorded during Four Seasons sessions, including his big "eye" songs, "My Eyes Adored You" and of course Mel Gibson's nice-stalker theme "Can't Take My Eyes Off You." That really is a beautiful romantic song. They finished off their main group career in 1975 with a couple of big fat hits. "December 1963" is about as good a song as they ever did - and a little different at that. But it's the stirring disco beat of "Who Loves You" that was the bridge to the Bee Gees work in Saturday Night Fever. Then again, now I'm hearing the proto-disco beat in "December 1963." Fleetwood Mac are known as children of Brian Wilson. Likewise, I'm starting to see the Bee Gees as the children of Frankie Valli. Frankie Valli (Francis Stephen Castelluccio) had a couple of big hits without the 4 Seasons, but that was having given up that famous unique vocal chemistry that was his main calling card. Still, "Swearin' to God" was a compelling jam in 1975. Then there was the monster hit title song to the Travolta movie Grease. As a teenage Elvis Costello fan at the time, I was not open to this highly overplayed hit. But in fairness, it sounds pretty good to me at this point, which could have just as well been a hit for the Gibb family from when it was written. Those horns are kinda thrilling. The box set comes with an enlightening and highly entertaining DVD gathering a dozen performances and videos, starting with a vintage 1963 Steve Allen performance of "Big Girls Don't Cry." Contrast that vintage look with the hep threads of the 1971 Top of the Pops performance of "Let's Hang On." Note the annotated photo galleries from this material listed below.